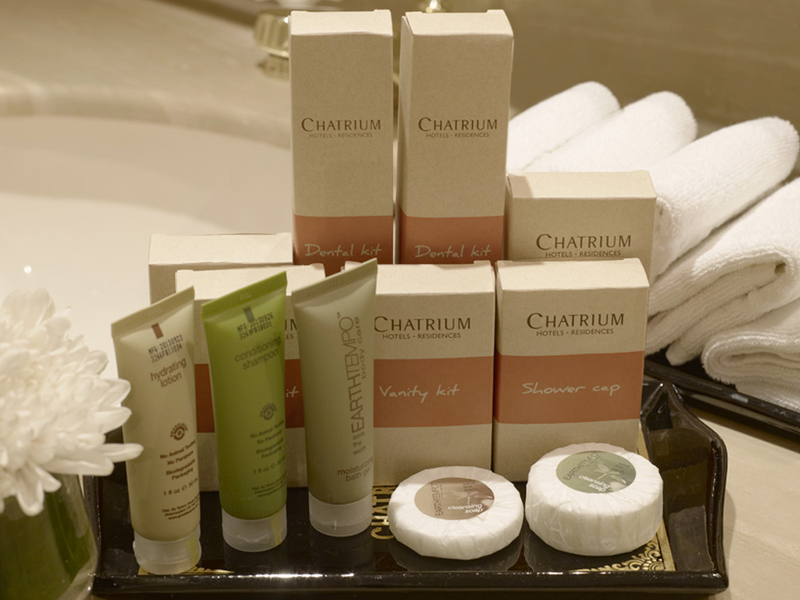 Chatrium Hotels & Residences is delighted to to launch eco-friendly hotel amenities in Bangkok and Yangon with personal care products by Earth Tempo Bodycare (TM). Sets of biodegradable amenities are made with a non-toxic, organic base and use 100% recycled paper and 100% biodegradable packaging when disposed in a landfill. All products such as soap, shampoo and lotion are formulated from natural ingredients. These new amenities will be offered to our guests at Chatrium Hotel Riverside Bangkok, Emporium Suites by Chatrium, Chatrium Residence Sathon Bangkok and Chatrium Hotel Royal Lake Yangon. It is all part of our ‘Think First Think Earth’ campaign, the ongoing Chatrium Green Project from Chatrium Hotels & Residences dedicated to a better environment. Our box packaging is made from 100% recycled paper. Our dental set comprising a biodegradable tooth brush is made from corn starch plastic and wrapped in a biodegradable plastic bag. Our shower cap is fully degradable and made from corn starch plastic. Our shaving kit is composed of a biodegradable razor, made from corn starch plastic, and a shaving cream tube developed from biodegradable plastics. All items are packaged in a biodegradable bag. Our vanity kit is 100% biodegradable and comprises cotton pads, emery board and paper based cotton tips. Our sewing kit is made from biodegradable components. All accessory items degrade to carbon and water within 24 months once disposed in a landfill.